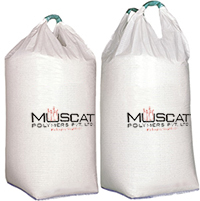 1 & 2 Loops FIBC Bags | Muscat Polymers Pvt. Ltd. The body and the loops are made of one piece of fabric which makes the construction and the design of the 1 & 2 loop FIBC bag more significant for in terms of its durability and capabilities. 1 loop filling spout with top lid. 2 loop filling spout with top lid.